By far the most effective way to attract the very best candidates for your building engineer vacancy is to advertise not only to people who are actively seeking a new job but also those who may not even be looking for one. The CABE Jobs market is great for advertising your quick-to-fill urgent vacancies to highly professional, relevant candidates who are actively seeking a career change but sometimes, if you have more time to recruit, you need to reach people who are not actively seeking a new job. 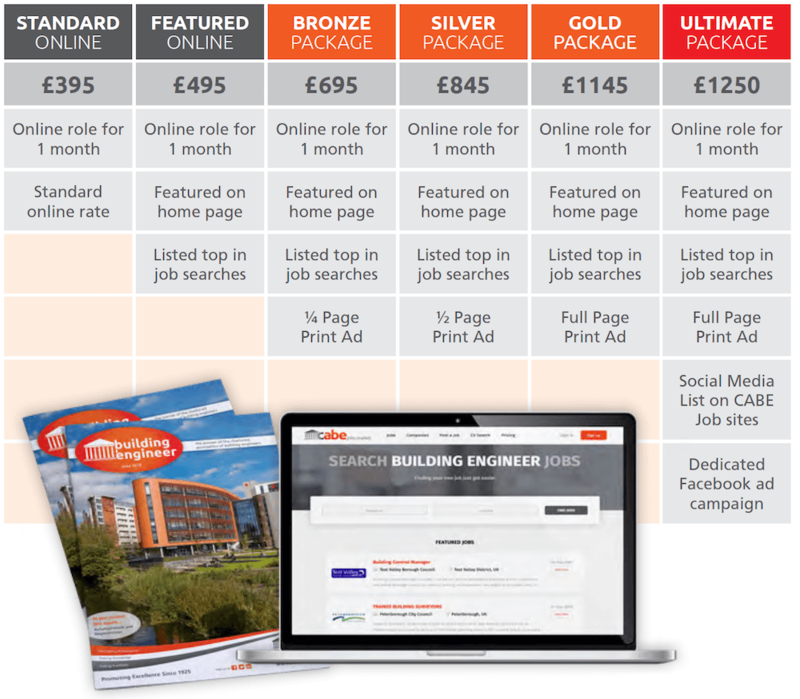 To ensure you reach both active and passive job seekers we have introduced new packages that combine an online ad with a printed ad in Building Engineer magazine. These new packages enable you to reach ALL potential candidates. Once you have decided on the package the best way to place a role is to let our recruitment specialists complete the whole setup for you. From reviewing the ads to uploading the roles for you, they will cast their expert eye over the adverts to ensure they are maximised to attract the very best candidates. You can pay by invoice (30 day terms), credit/debit card and Paypal.